In the first installment of this three-part series on preventing magnetic tampering in smart polyphase e-meters, I discussed the building blocks for isolated shunt sensing and presented two approaches for implementation: an isolated metrology analog front end (AFE) architecture and an isolated modular architecture. In this installment, I will look at both architecture choices in more detail. 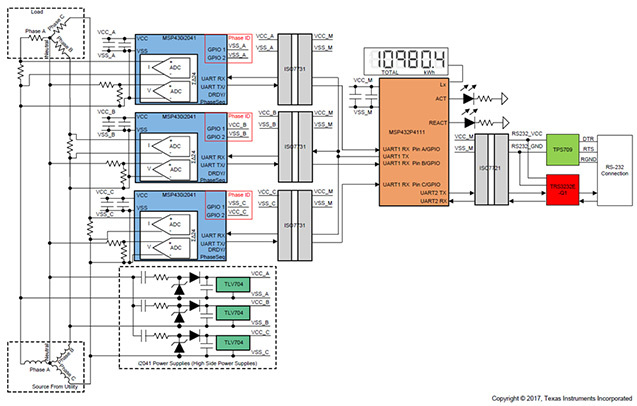 The first approach is a metrology AFE-based architecture where a metrology AFE microcontroller like the MSP430i2041 senses both the mains voltage and the voltage across the shunt. Using the voltage and current samples, the metrology AFE would then calculate the parameters of the phase and send the parameters to a host MCU, which would then aggregate the data from the different metrology AFEs. Since each metrology AFE is referenced with respect to a different phase, the communication lines from the metrology AFE to the microcontroller (MCU)/digital signal processor (DSP) must be isolated using external digital isolators, which enable the host MCU to properly communicate to the metrology AFEs on the different phases. The Polyphase Shunt Metrology with Isolated AFE Reference Design illustrates this isolated shunt sensing architecture. Figure 1 shows the block diagram of the polyphase shunt metrology design. In this reference design, the MSP430i2041 device is used as the metrology AFE, where it senses both voltage and current. The ISO7731 is the external digital isolator and the MSP432P4111 acts as the back-end device, metrology MCU and host MCU. In this implementation, each MSP430i2041 device operates independently off of its own internal clock, so the different devices are not synchronized with each other. As a result, in order to determine the phase sequence – which is the order of zero crossings between phases – it’s not possible to compare the ADC data from the different MSP430i2041 devices. Instead, a zero crossing signal output from each MSP430i2041 device determines the phase sequence by observing the order at which this signal is asserted among the different MSP430i2041 devices. 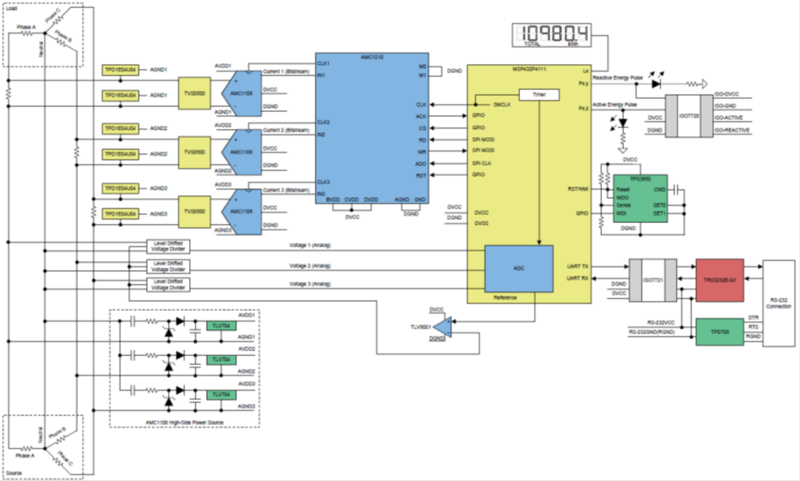 In this design, in every 50 mains cycles, an MSP430i2041 device calculates new metrology parameters and sends these parameters to the MSP432™ MCU for aggregation among the data from the other MSP430i2041 devices. For communicating from the MSP430i2041 to the MSP432 MCU, selecting a universal asynchronous receiver transmitter (UART) minimizes the number of isolation channels required and therefore the system cost. In Figure 1, a total of two isolation channels are used; however, there is also support for a three-channel variant, which can simplify the software implementation for communication. Since each of the three MSP430i2041 devices has a different UART transmitter signal, and you only want to use one UART receiver port on the MSP432 MCU, a multiplexing scheme will prevent any conflicts from the different MSP430i2041 devices. In this design, you can implement the multiplexing scheme by using the port mapping feature of the MSP432 MCU, which enables you to multiplex communication without adding any additional hardware. To distinguish the different MSP430i2041 devices from each other, each MSP430i2041 device is assigned an address that identifies the specific MSP430i2041 device in the command and response packets sent to and from the MSP432 MCU. The second approach to implementing isolated shunt sensing is to use an isolated modulator architecture. In this approach, a delta-sigma modulator measures the voltage across the shunt and outputs a bitstream that is isolated from the input. Since the output of the modulator is isolated, the outputs of modulators that measure shunt voltages on different phases can all connect to the same device for decimation. This isolated bitstream is then fed into a digital filter, which acts as the back-end device to generate analog-to-digital converter (ADC) values from this bitstream. For the digital filters, you can use either a metrology MCU with the necessary digital filters, like the MSP430F67641A, or a stand-alone digital filter like the AMC1210. For measuring the phase voltage, isolation is not necessary. Because voltage measurements do not have to be as accurate, you can measure the phase voltage with a low-resolution successive approximation register (SAR) ADC integrated within the metrology MCU. For proper metrology readings, the voltage and current sampling must be synchronized. The MCU then takes these synchronized voltage and current samples to calculate the metrology parameters. The Isolated Shunt Current Measurement with Standalone Digital Filters Reference Design illustrates the isolated modulator architecture, as shown in Figure 2. In this isolated shunt current reference design, the AMC1106M05 acts as the isolated modulator and the AMC1210 is the back-end device that decimates the bitstream from the AMC1106M05. Whenever new current ADC samples are available, the AMC1210 asserts its ACK pin to alert the metrology MCU. Using the AMC1210 stand-alone digital filter to decimate the bitstreams from the AMC1106 – instead of selecting an MCU with integrated digital filters – enables a wide choice of metrology MCUs, since the metrology MCU does not have to have digital filters. In addition, since the AMC1210 has four stand-alone digital filters that decimate bitstreams from all of the modulator devices, you only need one Serial Peripheral Interface port to get the current samples from all of the phases. A multiplexing scheme is not necessary. An MSP432 MCU is specifically selected as the metrology MCU in this isolated modulator design, where the metrology MCU communicates with the AMC1210 to get the current samples of all phases. The MSP432 MCU also senses the mains voltage using its 14-bit SAR ADC and calculates metrology parameters. The voltage and current samples of all phases are synchronized and available at the MSP432 metrology MCU. As a result, the MSP432 metrology MCU can determine the phase sequence by using the ADC sample data. Both isolated modulator and metrology AFE architectures have their advantages and disadvantages; I’ll take a look at both in the third installment of this series.